In the waters of the far-eastern equatorial Pacific – close to the South American coast – sea-surface temperatures are beginning to rise, prompting some climate scientists to believe the world could be heading for another El Niño in close succession to the previous event which ended last year. This diagram illustrates the observed sea surface temperature for a central region of the tropical Pacific (in black), and the evolution predicted by the Met Office dynamical long-range ensemble forecast system (in red). A typical threshold for El Niño is for the sea surface temperature anomaly to be above 0.5 °C. The last El Niño, which peaked in the winter of 2015-2016, was the joint strongest event on record. It had impacts around the world and the heat released from it added to existing climate change to break global surface temperature records in 2015 and 2016. Any El Niño event (which is the warm phase of the El Niño-Southern Oscillation) has impacts on the global climate. If an El Niño does grow by summer some of the earliest impacts will be on the Atlantic hurricane season and the Indian monsoon, both of which tend to weaken during a developing El Niño. You can learn more about the El Niño – La Niña cycle and its impacts on our web pages. 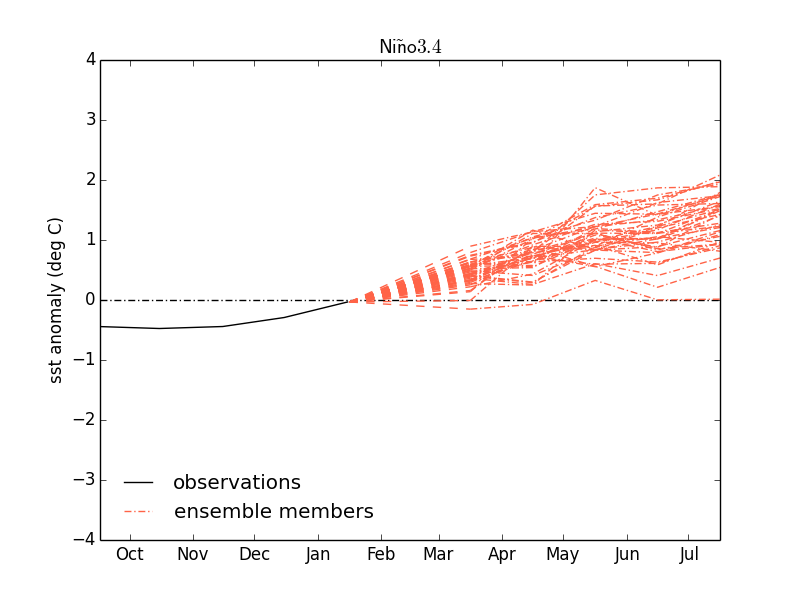 The World Meteoroligical Organization’s ENSO outlook is available here. This entry was posted in Met Office News and tagged climate, El Niño-Southern Oscillation, El Nino, global temperature record, La Niña, Met Office Hadley Centre, sea surface temperatures, temperature, WMO. Bookmark the permalink. 2 Responses to Another El Niño on the way? I can understand why you’re being extra careful about not committing yourself to another El Niño event, in light of the poor forecast that the Met Office made for winter 2016-17 in the UK. There seems to be an even greater degree of chaos going on with the global circulation at the moment, that the various NWP models just can’t seem to get to grips with. Quite plausible as the signs have showed warm water hanging about but could a multi-year La Niña follow after? It certainly took time for the last El Niño to get going.